Elvis Presley: TopResume celebrates an international icon 40 years after his death. Forty years ago, the world lost one of its most beloved — and controversial — rock ‘n’ roll stars of all time. A global legend in the entertainment business, Elvis Presley died at the age of 42 on August 16, 1977, in Memphis. The disheartening anniversary got us wondering how The King would position himself for new opportunities in today’s ultra-competitive music industry. 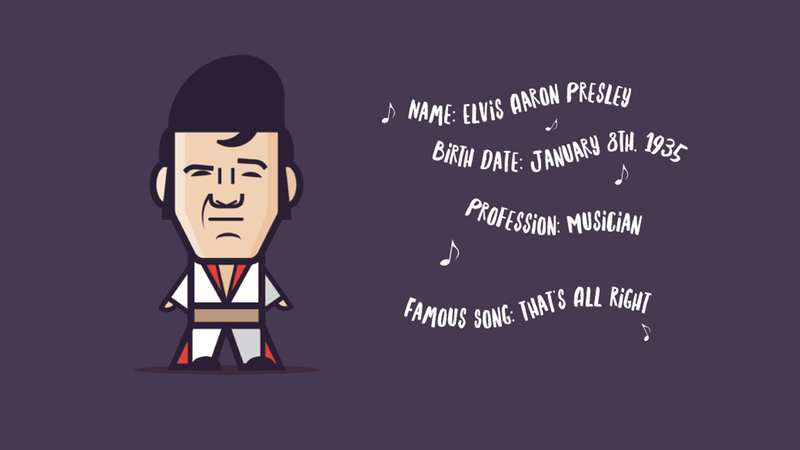 So we cranked up some “Heartbreak Hotel,” grew out our sideburns, whipped up a fried peanut-butter-and-banana sandwich, and created this fictional resume for you. What you won’t see as you dig into the document is that in 1954, Elvis began working for Crown Electric Company. He performed various jobs, including driving a truck and delivering supplies to job sites. He also went to night school and studied to become an apprentice electrician. Around this time, his music career was transforming out of humble beginnings into breakthrough success. We think he made the right career choice. 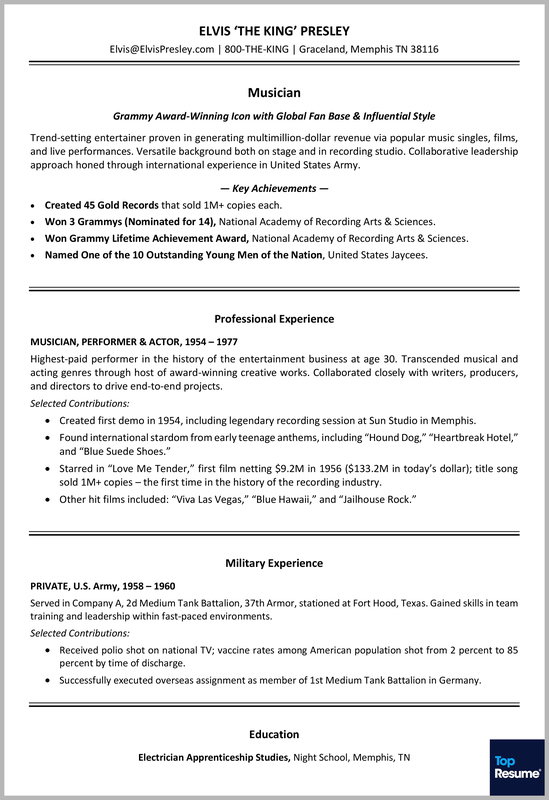 Below is a breakdown of The King’s professional musician resume. We positioned Elvis as a musician, but he can alter the headline to “Musician, Performer, & Actor” if he is targeting a broader audience. The key is to use Elvis’ resume professional summary to paint him as an accomplished, collaborative talent so agents and record labels will want to work with him. In general industries, you’ll find a list of strategic keywords at the top of the resume, usually in a section titled “Areas of Expertise” or “Key Proficiencies.” In the music industry, it’s all about who you know and less about the buzzwords in your document, hence the “Key Achievements” section to show off some of Elvis’ most impressive hardware. We strongly recommend listing your main job responsibilities in a short paragraph while breaking down your achievements in bullets. This helps recruiters scan through your document during their initial review — which can last all of six seconds! Always a plus to highlight on your resume, a military background shows skills in leadership, self-discipline, work ethic, decision-making, and teamwork. Elvis was lauded for his service in the U.S. Army, which came at the height of his popularity. While many fans wrote letters to the government to keep their favorite performer out of harm’s way, Elvis boldly and proudly served his country. Even though his training background had nothing to do with music, it is still an important section to include on his resume. Applicant tracking systems will scan your professional resume for your educational background. If nothing shows up in the report, you may not make it through this initial phase of the recruitment process. 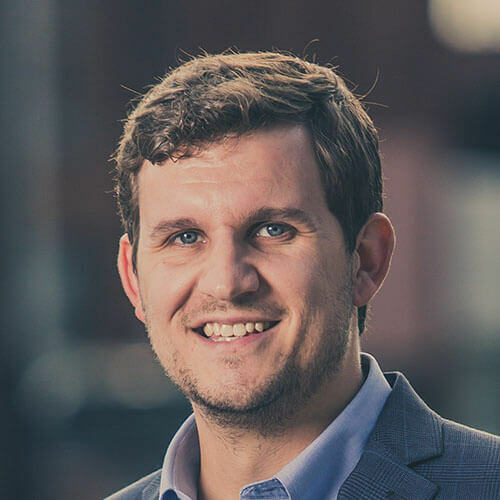 Need help writing resume that recruiters can’t help but fall in love with? Request a free critique today.